It's hard for most of us here at the MF to believe, but we opened Inner and Outer Space one year ago this week. Most of the pieces stayed on exhibit for the published run of the show (04.46.2008 – 01.11.2009), but there were two we decided to extend. Sarah Oppenheimer's 610-3356 remains open indefinitely on the 4th floor of 500 Sampsonia Way and Yumi Kori's kanata will be open through Sunday, May 10th, on the museum's lower level. In honor of its closing next week, here's an Artist Spotlight (including audio) on Yumi Kori. Working as an architect and visual artist, Yumi Kori creates spatial installations: worlds to inhabit and experience. Here Kori immerses us in an underground ocean of darkness, causing the viewer to lose some sense of space and time. The visitor is drawn to the pier—walking out over the water. There is an almost gravitational pull toward the red doorway, a rectangle of hazy light that appears in the darkness. It calls to us—inviting, yet forbidding. The red rectangular outline frames a textured space behind, offering a tangible reality, and yet some part of it is a reflection. Kori is not just offering an abstract space or form, the red doorway is instead a convergence of reality and illusion. It fluctuates like an optical illusion between depth and flatness depending on where the viewer focuses their attention or depth perception. Visitors feel like they are traveling and yet go nowhere physically, but instead somewhere in the mind, between eye and brain. The piece encourages us to ask some existential questions: why are we here? This is a space in which to contemplate existence. Kori is interested in creating desire in the audience—the desire to “go”—somewhere—but where? Why do we all have this desire to “go”—where are we going? She is asking us to consider: what is the purpose of this life; where are we all headed on our personal journeys? Is it destiny or Karma that determines the course of our life? The space is like a hidden lagoon under the movement of every day life above; visitors and staff in the Mattress Factory building. The sound installation—a layering of white noise that Kori composed for the work, creates and accentuates the self-contained nature of the space. We're ten days out from nearing the opening reception for Gestures: An Exhibition of Small Site-Specific Works, guest-curated by Katherine Talcott. Artists are installing in their space and the exhibition is coming along. Hands-down, my favorite time here at the museum is the ~ 2 weeks before an opening; artists are working, the galleries are buzzing with activity, everyone's creative juices are flowing, and the energy is infectious! Don't take my word for it, just check out Josh Tonies' video below. He's documenting his install via time-lapse. Great stuff. If you're a regular reader of this blog, you know we rely heavily on the good word of our supporters to help get MF news out to the people. If you'd like to help support the cause, you can RSVP to the FaceBook event for the opening. Also, below are two different sizes of embeddable GESTURES e-flyers. Feel free to copy and paste the corresponding HTML code onto your blog or other social networking site. 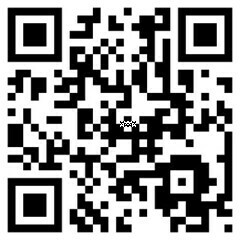 Or download one of the images and email it to your contact list. Anything you do is greatly appreciated! 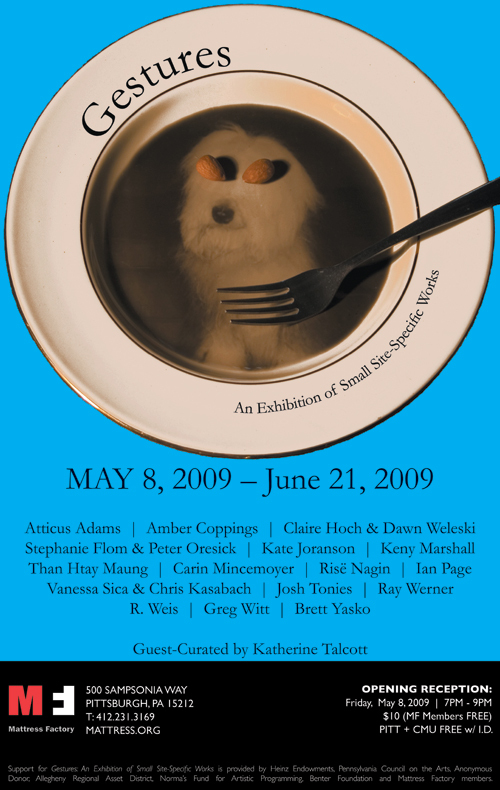 On May 8, 2009, the twelfth installment of the Mattress Factory’s Gestures: An Exhibition of Small Site-Specific Works series will open with a reception (FaceBook Event) at the MF's annex gallery located at 1414 Monterey Street. Independent curator and newly-appointed Administrator for the City of Ann Arbor, Michigan’s Percent for Art Program, Katherine Talcott, will guest-curate the exhibition. Prior to her current consultant position with the Ann Arbor Public Art Commission, Talcott was the Curator for the Three Rivers Arts Festival visual arts program from 2002 - 2007, as well as the curated exhibitions at the 937 Liberty Avenue Gallery. The upcoming installment continues to bring together a diverse cross-section of talents and practices. Exhibiting artists include Atticus Adams, Amber Coppings, Claire Hoch & Dawn Weleski, Stephanie Flom & Peter Oresick, Kate Joranson, Keny Marshall, Than Htay Maung, Carin Mincemoyer, Risë Nagin, Ian Page, Vanessa Sica & Chris Kasabach, Josh Tonies, Ray Werner, R. Weis, Greg Witt and Brett Yasko. An opening reception will take place on Friday, May 8, from 7:00 PM to 9:00 PM. Admission is $10.00. MF Members, PITT and CMU students are FREE with I.D. Light refreshments will be served. We hope to see you there. Gestures: An Exhibition of Small Site Specific-Works runs through June 21, 2009. Celebrate EARTH DAY by Going GREEN with Us! If you've been reading the MF blog during the past few weeks, you know we've been posting about some of the greening initiatives the museum has recently undertaken. You know all about the QR codes in our galleries that will drastically reduce the quantity of printed gallery guides. 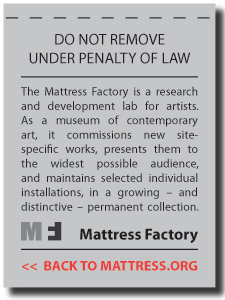 And you know the Mattress Factory was the first museum in the United States to offer a 100% paperless GREEN membership level, which allows a greater percentage of your membership dollars to directly support the art. Today is Earth Day, so leave it to us to do something special in observance of this very important eco-tradition. Earth Day was founded in 1969. That's 40 years ago. Sticking with the number 40, we're offering a 40% discount on MF Green Memberships to anyone who signs up or renews by midnight tonight. That's a full $20 off the regular price with all the same perks (FREE admission, Shop/Café discounts, etc.)! Member support directly translates to artist support, and is the heart-and-soul of what we do here at the museum. Go green with us and save a little green, too! 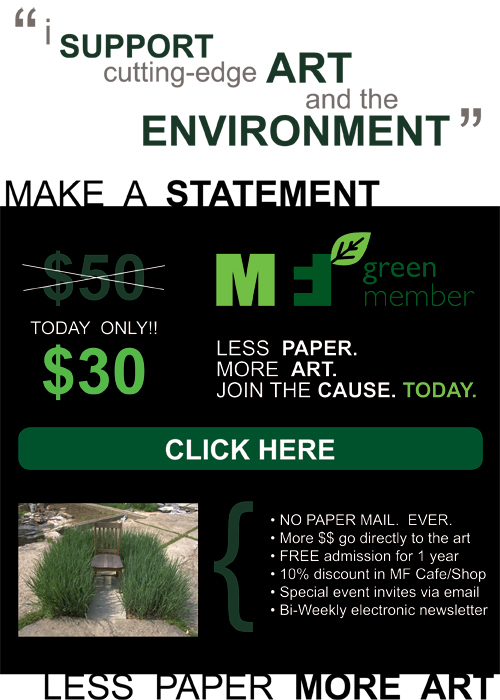 Please consider becoming a GREEN member today! Last month we announced on Twitter that the Mattress Factory would be participating in a summer softball league with other cultural attractions located here on Pittsburgh's North Side. The artsy-types we are, we were vastly more confident in our team t-shirt design skills than our ability to score runs and win games. That being said, we decided to take team name submissions from our Twitter posse. We received a nice menu of potential team names, but couldn't choose the one, so we decided to let you, the readers of the MF blog, pick our moniker for this, our inaugural softball season. So for seven days back in early March, we posted all the submitted names here on the blog and invited readers to select their favorite. 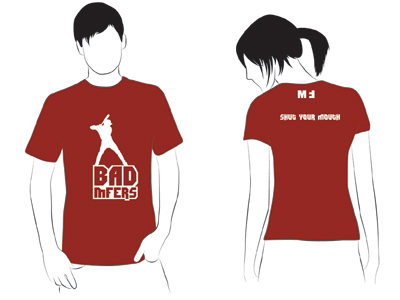 The clear winner quickly rose to the top, and with a decisive 65% of the popular vote, Koven Smith's submission (BAD MFers) became our team name. Designer rendering of our softball team T-Shirt. Playoffs & Championship Game Begin August 3rd. The Thaddeus Mosley exhibition has been open for about a week and one of the most popular elements of the show for many visitors is the GigaPan of Thad's home we're projecting in the third-floor gallery. Opposite some of Thad's smaller-scale sculptures, visitors can approach an interactive computer terminal and operate, manipulate and investigate an extremely detailed image of Thad's remarkable home located just a few blocks away from the museum here on Pittsburgh's North Side. For those new to the technology, Gigapan is a collaborative project between Google, Carnegie Mellon University and NASA Ames Intelligent Systems Division's Robotics Group. In essence, a robotic platform is attached to a digital camera. The robotic mechanism allows a user to take a photograph, then it will re-aim the camera with great precision, to take another photograph. After taking many photos, GigaPan software stitches all the pictures into a gigapixel image that can then be explored by zooming into the image's great detail. The GigaPan of Thad's home we have projected in the galleries is embedded below. Feel free to explore and tag this image. To launch in a full-screen viewer, CLICK HERE. A few weeks ago (March 21 to be exact) we held an event in association with the PREDRIVE: After Technology exhibition. 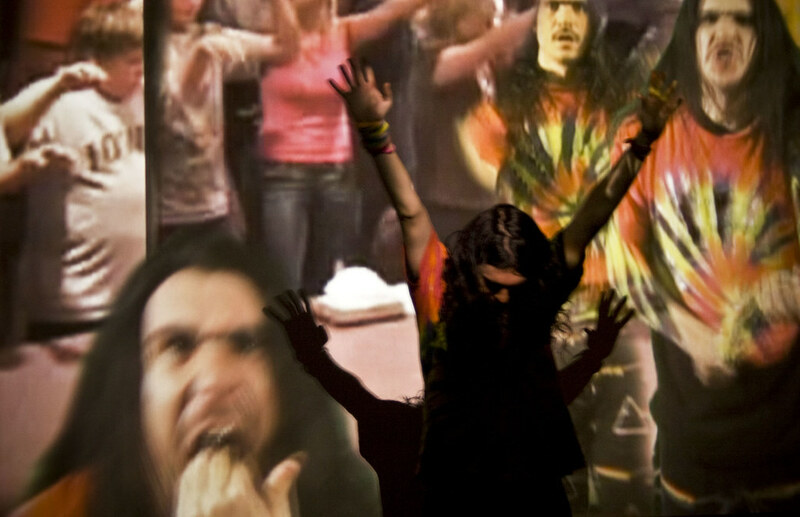 PREDRIVE: New Music + Media featured performances from Extreme Animals, Jacob Ciocci of Paper Rad, LoVid and NAUM f/ Antoine Catala. It was truly a great event, but LOUD, as one attendee noted on the SCREENtxt wall. A big THANKS to Haley Harned for shooting the awesome photos of the performances below. Throughout the month of April, I'm visiting with other MF staffers to talk about their everyday efforts to green the Mattress Factory. In this first episode, I chat with Jeffrey Inscho about the roll-out of QR codes in the galleries, an initiative intended to reduce the amount of printed gallery cards the museum produces and distributes. Up next in the Greening of the Mattress Factory series, I sit down with Barbara Luderowski to talk about the retro-fitting of museum properties and environmental aspects of new MF construction. If you can't see the embedded video above, CLICK HERE to open a new window. Several years ago, upscale fashion designer Bill Blass dropped by the Carnegie Museum of Art while on a business trip to Pittsburgh. 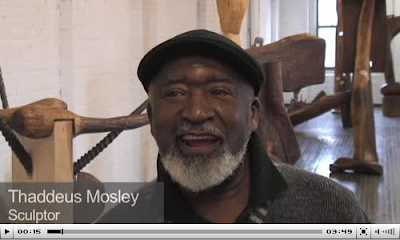 Looking at the collection, he said "Georgia Gate" by Thaddeus Mosley was "the finest thing in your museum," then-museum director Leon Arkus told Mosley later on the phone. "You should have told Mr. Blass I have one of his jackets," the North Side artist recalled with a characteristic warm smile and laid-back humor. Mosley, who enters his 83rd year in July, is accustomed to accolades, accepting them graciously, almost bemusedly. 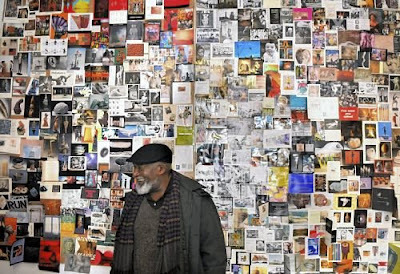 The most recent is a two-floor solo exhibition, "Thaddeus Mosley: Sculpture (Studio/Home)," that opens Friday night at the Mattress Factory. A New Castle native, Mosley entered the Navy after high school and served in the South Pacific during World War II. "It was segregated. We called it the Black Navy. This is the way America was then," he says. After graduating from the University of Pittsburgh, where he majored in English and journalism, Mosley supported his family by working for the U.S. Postal Service. But the muse visited him during his free time. A jazz aficionado, Mosley was reading Marshall Stearn's book, "The Story of Jazz," in the early 1950s when he came across a photograph of grave markers in a Georgia cemetery where slaves had been buried. Click image above to view a video interview produced by Nate Guidry. 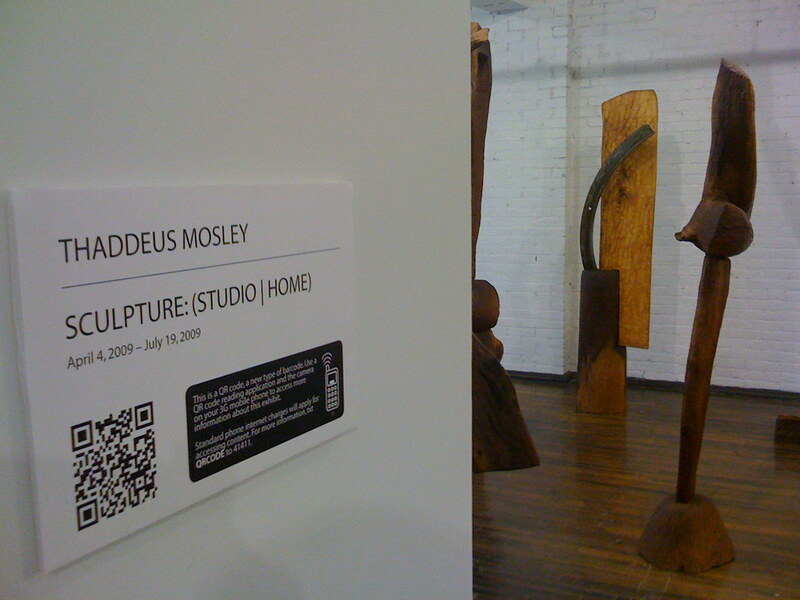 "The moment I saw that picture I thought of [celebrated Romanian sculptor Constantin] Brancusi's 'Bird in Space' sculptures," Mosley said during an interview for "Thaddeus Mosley: African-American Sculptor," a 1997 book about his work written by David Lewis and co-published by the Carnegie and University of Pittsburgh Press. "Straight away I thought how the slaves who made those staves and Brancusi had never known each other existed, had never seen what each other did. Yet in each of them I saw a similar spirit, a similar approach to clean, fluid shapes coming from people working close to the earth and trying to fuse the earth and human spirituality into a single form." Those forms "heavily influenced" the Carnegie sculpture, and four other "Gate" works, two of which are in the show. They don't all look alike, Mosley says. The connection is "a feeling, rhythm and textures, that sort of thing. Repetition. Concentric effects. Mostly it's a weight and space concept. You should get a sense of levitation, a feeling of movement as you walk around them, because of their weight and space." As he talks, Mosley moves through a forest of sculpture, some of it nearly twice his height, each piece unique. He typically creates abstract wood sculpture (but employs other materials), given texture by varying patterns gouged into the surfaces. But a sinewy elongated form of a woman twines among vines gathered along the nearby Allegheny River in one sculpture, and a suggested truncated figure rises from a component inspired by a Dogon stepladder in another. Three are anti-war pieces made in response to Iraq, including the thorny "Weapons for Mass Protection," and bone-accentuated "Tooth for Tooth" that was exhibited by the CUE Art Foundation in Chelsea, New York City, in 2004. Of the approximately 80 sculptures displayed, about 30 have never been exhibited and 40 have not been shown in Pittsburgh. Most were made between the late 1990s and last month, and "represent 70 percent of what I've done in the last 10 years," Mosley says.